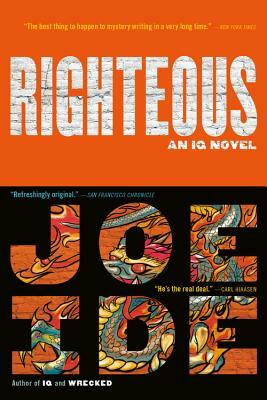 Joe Ide’s debut novel, IQ, was one of my favorite books of 2016. The concept was cool and unique: an edgy Sherlock Holmes with a hip hop flavor. Righteous is no different and picks up right where we left off. Isaiah Quintabe or IQ receives a cry for help from his brother’s former girlfriend, Sarita: find her younger sister, Janine. What follows is a sometimes comical high stakes journey to the neon lights of Las Vegas where Isaiah finds himself pitted against a psychotic loan shark and a Chinese triad. Meanwhile, he continues to obsess over the hit and run that killed his older brother, Marcus, eight years ago. The two storylines intertwine together seamlessly, revealing IQ’s intelligence, wit, and buried pain. I love the way Ide guides us down one path only to bring us to a conclusion that is surprising yet so inevitable, we wonder how we missed it. Another standout from Ide and the IQ series. For ten years, something has gnawed at Isaiah Quintabe's gut and kept him up nights, boiling with anger and thoughts of revenge. Ten years ago, when Isaiah was just a boy, his brother was killed by an unknown assailant. The search for the killer sent Isaiah plunging into despair and nearly destroyed his life. Even with a flourishing career, a new dog, and near-iconic status as a PI in his hometown, East Long Beach, he has to begin the hunt again-or lose his mind. A case takes him and his volatile, dubious sidekick, Dodson, to Vegas, where Chinese gangsters and a terrifying seven-foot loan shark are stalking a DJ and her screwball boyfriend. If Isaiah doesn't find the two first, they'll be murdered. Awaiting the outcome is the love of IQ's life: fail, and he'll lose her. Isaiah's quest is fraught with treachery, menace, and startling twists, and it will lead him to the mastermind behind his brother's death, Isaiah's own sinister Moriarty. With even more action, suspense, and mind-bending mysteries than Isaiah's first adventures, Righteous is a rollicking, ingenious thrill ride.